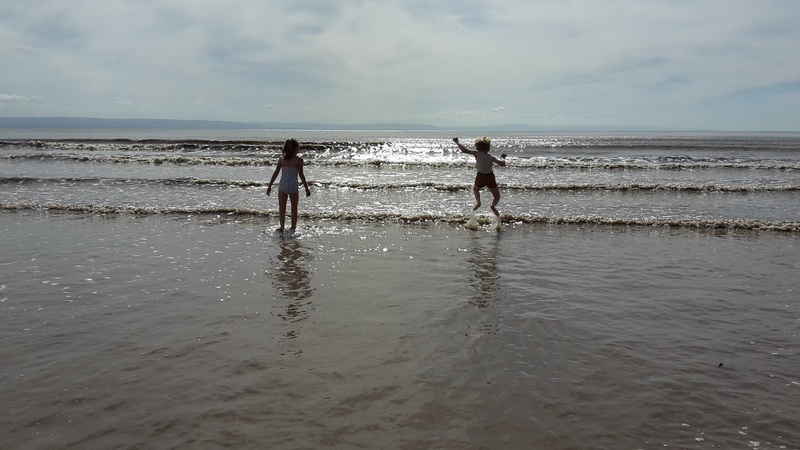 We had a fantastic camping trip this week at Greenacres Camping and on a warm sunny day, as we live in land locked Wiltshire, we were desperate to go to the beach. We craved the sea, the beach, ice cream and space so we perused the map and decided to head out to Brean Down. The approach road runs through caravan park alley with scatterings of shops, amusement arcades and pubs. Not what we were craving but I knew that there was a light at the end of this particular tunnel. Once we had driven as far as is physically possible we parked up in the National Trust car park - free for members otherwise £3 for the day - and unloaded the boot of the usual beach paraphernalia and necessities; beach tent, towels, picnic, drinks, swimming gear...crucial things missing!? Bucket and spades! Luckily there is a well stocked National Trust shop where we picked up two spades and a bucket and we were good to go. We took the steps over the sea wall and before us found a surprisingly quiet beach which loads of space as the tide was, what looked like, miles out. But this was fine as had our bucket and spades and we had tonnes of sand. Word of warning here - the beach is sandy but as you go out towards the sea at low tide there are dangerous mud flats and quicksand exposed, reassuringly the lifeguard was on his tannoy warning people if they ventured too far out. So, we stayed at the top of the beach and got digging. Led by the children we all dug out a moat, built castle walls, created turrets - with varying degrees of skills, mine being the worst, and blinged the exterior with tiny clam shells found on the beach by the girl. And then we wanted people. "We should have brought our Lego men", said the boy. 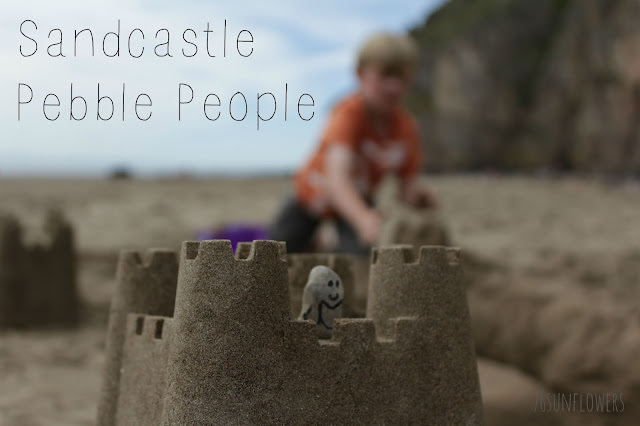 Then he had a genius idea, "Pebble people!" The two of them found pebbles and with a pen scavenged from my bag they set to work creating their own set of knights to protect the castle. A couple of hours later and picnic consumed we started to hear the gentle swoosh of the waves as the tide began to come in. As the afternoon progressed the sun got brighter and brighter too; perfect timing for a dip in the channel. The water was warm and with warnings not to go too far out the two of them were in and having an absolute ball. With the bribe of ice cream before the shop shut we packed up our beach tent and went and chose our favourite Marshfield Ice Cream flavours - the best ice cream FYI! 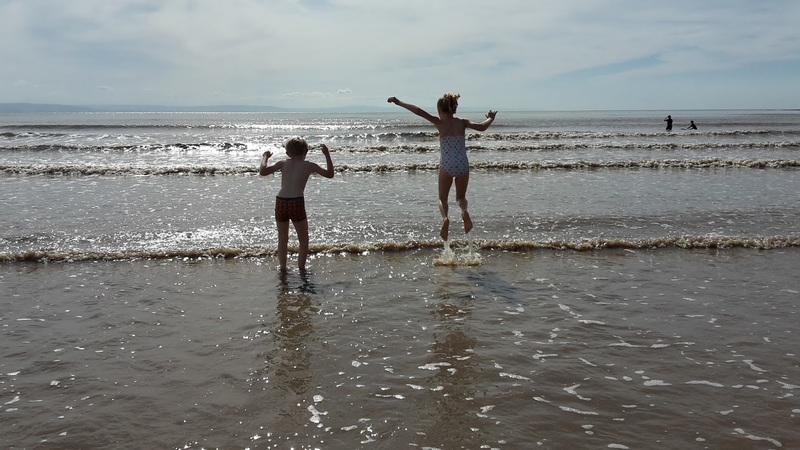 With sandy hands clutching waffle cones we headed up the 218 steps - as counted by the girl - to the top of the down; a natural pier a mile and half out to sea separating Brean from its neighbour, Weston-Super-Mare. We headed out to the end taking in the breath taking views all around us. We finished the day picking up Fish and Chips from a chippy in Wells on our way back to our campsite - a perfect end to a perfect day. 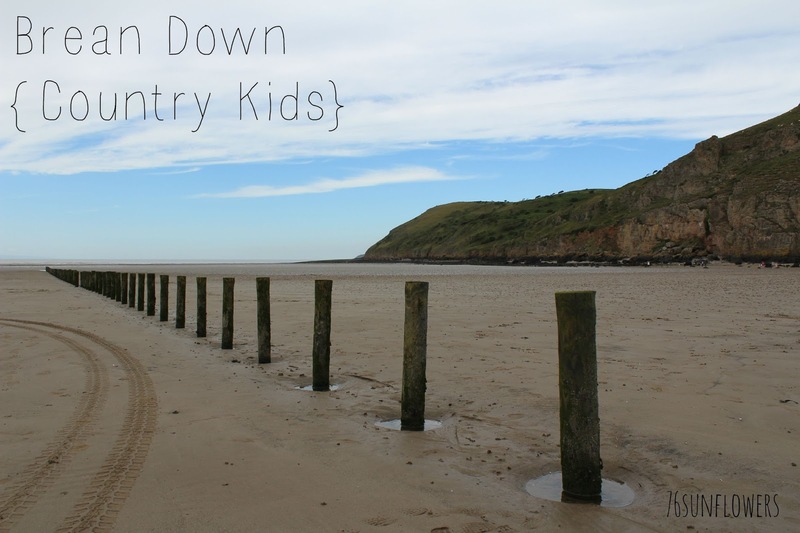 If you're looking for a fantastic campsite in Somerset take a look here!